Crystal City’s bevy of aging office buildings have long been in need of a makeover, and Arlington officials hope Amazon’s arrival will spur some big development changes in the neighborhood. The tech giant itself will be responsible for a major transformation of the newly christened “National Landing” all on its own, of course. Amazon will start off by leasing space from property owner JBG Smith in Crystal City, with plans to fully renovate those office buildings, and even construct its own facilities on various plots of land in Pentagon City. And while the company could one day control as much as 8 million square feet of office space in the area, there are plenty of other buildings dotting Crystal City’s landscape that Amazon won’t touch. 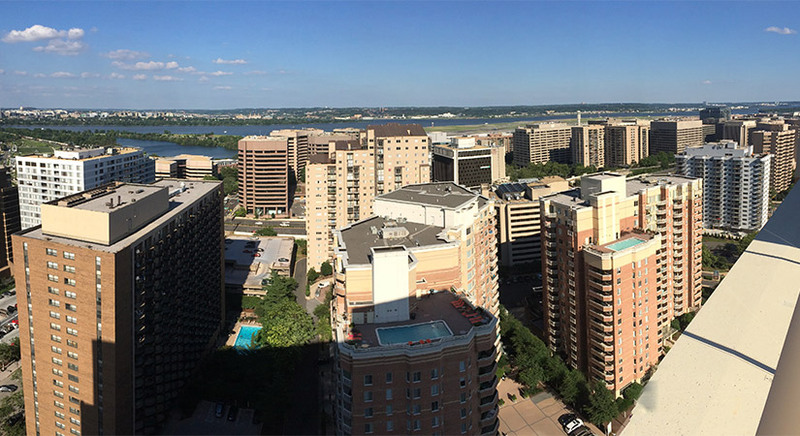 JBG alone controls another 6.2 million square feet of office space throughout the neighborhood, including a whole variety of buildings constructed decades ago, when Crystal City was primarily a home for the military and federal agencies. It’s those structures that Arlington leaders are most anxious to see receive a refresh, in order to lure even more businesses to the area. While Amazon’s new headquarters will put a huge dent in the neighborhood’s office vacancy rate, officials say the county still has plenty of work left to do in that department. Sally Duran, the chair of the county’s Economic Development Commission, pointed out that business leaders have been strategizing ways to orchestrate such changes in Crystal City for years now, dating back to the immediate aftermath of the Pentagon’s Base Realignment and Closure process. But the county lacked any sort of driving factor to spur that change, she noted, making Amazon’s selection of the area quite welcome news indeed. With Amazon about to bring 25,000 jobs to the area, he expects to see plenty of developers choosing the third option. Even before Amazon’s announcement, Fusarelli says the county was projecting an additional 20 million square feet of development in the area he dubbed “the Route 1 corridor,” rather than the controversial “National Landing” moniker, through 2025. Accordingly, he expects that the county will be ready to embrace all that new change, rather than be overwhelmed by it. Of course, there’s plenty of community consternation around just how the area will cope with Amazon-related growth, with apprehension surrounding everything from the company’s impact on transportation networks to home prices. But county officials remain adamant that the slow pace of the tech giant’s arrival, to be stretched out over the better part of 12 years or so, will help Arlington adjust to the changes gradually. The company plans to add only a few hundred workers in the near term, then bring on about 2,000 staffers a year through 2030. Officials also stressed that the county will review every step of the assembly of the new headquarters. The County Board will vote no earlier than February on the outlines of the state’s proposed deal with Amazon; then, the company will submit individual applications for each new piece of construction it’s planning, most of which will require the Board’s scrutiny. Fusarelli says the county doesn’t expect to see any applications from Amazon until early next year, projecting a first Board vote on new Amazon developments by mid-2019 at the earliest.